Newton Wonder is a high quality late-season English cooking apple from the Victoria era, producing large handsome apples. It inherits its excellent tangy flavour from one of its probable parents, Dumelow's Seedling. It cooks to a light puree. The flesh is less juicy than some cookers, making it useful for recipes where you do not want too much moisture such as mincemeat. Overall, Newton Wonder makes an interesting alternative to the more well-known Bramley. Please fill in the details below and we will let you know when Newton Wonder apple trees are back in stock. Bramley is the essential English cooking apple, famous for its rich sharp acidity. Bramley 20 is a naturally smaller version of Bramley's Seedling (the apples are the same size though). Howgate Wonder is descended from Newton Wonder. Newton Wonder is in flowering group 4. Newton Wonder is partially self-fertile, but fruiting will be improved if there is a compatible tree of a different variety nearby. Newton Wonder is a vigorous-growing tree, adaptable to most UK climate situations. Disease resistance is generally good. 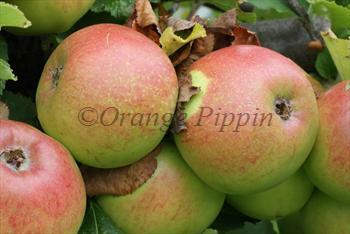 Found in Derbyshire in 1887 and thought to be a cross between Dumelow's Seedling and Blenheim Orange.